The recent Iron Man was such unexpected fun for two reasons: It hadn’t been done before (live-action style, at least), and the presence of the entertainingly ranting Robert Downey Jr. injected it with something missing from the usual FX and melodrama mishmash of so many comic adaptations. Its action “set pieces” were nothing special, but it zinged whenever the lead was onscreen. The Incredible Hulk is in theaters barely a month after Tony Stark’s coming out, in what seems an unparalleled act of movie market-glutting. For the unaware, Hulk and Iron Man populate the same Marvel Comics universe, and have paired up with others in the super-team called the Avengers, portrayed in yet more upcoming features that both this and Iron Man cutely bend over backwards to advertise. The ploy makes both sides happy — fans merrily swill the cameos, dropped hints and tie-ins, while the studios, filmmakers and actors (and Stan Lee) lucratively perpetuate the brand. The prospect of these Marvel spectacles crowding out less strictly teenage blockbuster fare for the next decade might please others less. Fighting it would be like trying to stop a bullet train with a handheld stop sign. The one-two punch of this Marvel spring saturation means that you can’t help but compare the two movies. Stark’s name and, um, image are here, and the “memories” of the former movie are still fresh in our minds (assuming you saw it, as the Hulk machine smugly does, knowing that if they’re wrong you’ll buy another ticket or DVD to play catch-up). Alike in their weaknesses, the two movies both climax in audience-punishingly loud and busy street brawls between huge CGI lumps. Jon Favreau was able to practice some taste and patience during his movie’s expository scenes, but Louis Leterrier’s share his action scenes’ incoherence. The Transporter 2 director goes helicopter-shot crazy here, and elsewhere is unable to find anything remarkable to do with the Zak Penn-credited, Edward Norton-tooled script. Bruce Banner, the hero and Hulk’s alter ego, is in many ways a more interesting character than Tony Stark, but here he makes for far less engrossing cinema — the absence of Downey Jr.’s spark is sorely felt. Jeff Bridges and Gwyneth Paltrow are missed, too — a bored William Hurt (uninspired casting, that), as the mostly villainous General Ross, and Liv Tyler as Banner’s girlfriend and doctor in her own right, Betty, make nothing of their opportunities. The Incredible Hulk is being called a “reboot” of Ang Lee’s 2003 interpretation, appropriate terminology for a movie that looks so much like a video game. 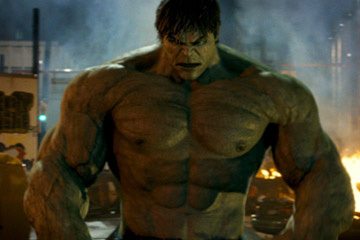 Hulk is an oddball, “cerebral” to its supporters and “boring” to its (more numerous) detractors. Complaints that the beast looked “like Shrek” and jumped around like a bouncy ball might be truer, but the movie confirms that Lee shouldn’t do pop; his attempts to “enliven” the material and make it more like a comic book with screen panels and visible page breaks was the cinematic equivalent of Karl Rove dancing. Leterrier is a less bold but better choice. “Admittedly I’m not the most adult director,” he has said, and comic books are not the most adult source. The bright, thrilling stupidity of the Transporter movies confirms his low but honest aims, but either through his own failings or the over-meddling of collaborators, he isn’t able to carry it over to The Incredible Hulk. A chase over Rio de Janeiro rooftops recalls a similar one from Mission: Impossible III, but lacks the smooth clarity that J.J. Abrams managed there. The scenes of destruction in New York City hearken back to the similarly dark and sloppy 1998 Godzilla; it’s a bummer to watch the streets of the great city loudly chewed up and spit out yet again. At least I Am Legend showed a little respect. A happy, hulking Lou Ferrigno, from the old television series, pops up, as he did in 2003, and the audience I saw it with clapped with delight at the reminder of the genuine article. But the unstoppable trend for digital one-upmanship assumes that viewers are no longer scared of flesh, spray-painted or otherwise. Critics of CGI skeptics say that the old days of analogue effects are fruitlessly romanticized, that action fans should stop pining for some fantasy of bearded hippies hunched over meticulous handcrafted models and embrace the future. Still, it’s frustrating that disbelief suspension is growing more difficult when it should be getting easier. Terminator 2 came out 17 years ago and liquid metal still looks cool, a fact that the current state-of-the-art effects-driven movies should have to answer to. The army of Incredible Hulk visual effects people used a combination of animatronics, makeup, and CGI to present their vision, but when he appears, it’s still laughable — a cartoon. When he is unveiled in daylight, a pair of dramatic dolly zooms show the awed reactions of Hurt and Roth. It’s funny; it’s how the audience should react too, were the Hulk not so silly-looking. As motion-captured with Norton, he is more expressive and darker than the 2003 version (who actually started out gray as a nod to the comics), but he’s still Shrek. Before his initial transformation inside the bottling plant where he works, Banner warns, “Something bad is about to happen.” He’s right.